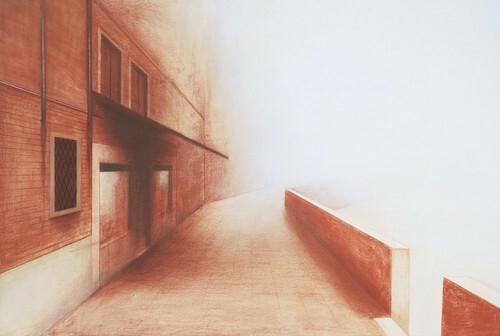 Eduard Angeli, Fog, 2008, sanguine on paper, 40 x 60”. Silent space is the dominant theme in this retrospective of paintings by Austrian artist Eduard Angeli. In works from his early desertscapes—For a Great Purpose, 1973, and Fire, 1977—to his cityscapes of the late 1990s, he invites us to see the incessant loneliness of silence on a grand scale. Angeli gradually abandoned human figures and nature (deserts, grasslands, mountains) for strict geometric forms (concrete or stone constructions), and bright pastel shades for crumbling muted tones, all the possibilities represented by the desert horizon for a pervasive sense of dread. The grim housing complexes of Building and Rear Courtyard, both 2005, emerge from thick black gloom, parodies of the imperial splendor of Venice, Saint Petersburg, or his hometown, Vienna. Single objects disrupt the severe angles of The Passion and Roman Anatomy, both 1986, and Parasol, 2005, with signs of life, while Bar, 2006, Fog, 2008, and Newsstand, 2016, show places of personal interaction emptied of life, leaving the viewer as the only witness to such isolation. Angeli is an exceptional technician, always reaching a compromise between his desire to make stillness visible and his inclination for abstraction by letting color and mood speak in the absence of voices. Remove the faceless bodies from his early work, or the inanimate objects from his later work, and he becomes a Color Field painter registering the absence of people with washes of hues that could only be given their texture by a human hand.